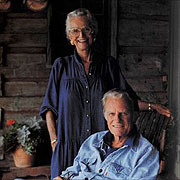 Billy Graham’s wife, Ruth has finished the race. One of my favorite stories about Ruth Graham was when I watched an interview she and Dr. Graham had with Diane Sawyer many years ago. Diane soberly asked Mrs. Graham, had she ever in all their years of marriage ever thought of divorce? Without missing a beat, Mrs. Graham smiled and said no, she never had. Murder, yes. Divorce, no. She was real, her books were great, prayers go for her husband, her children, her family, and to a world that will miss her. God bless Ruth Graham. She was 87. May she rest in peace and may her family draw comfort from the Words they have trusted.